Broadside. Toronto Reference Library Baldwin Collection. Public Domain. 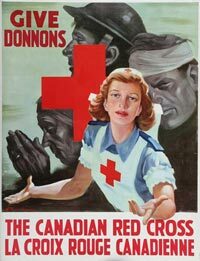 The Second World War is referred to by many as “the good war”, and this can be true in a wide variety of ways. The Second World War brought an abundance of opportunities for everyone around the world, and more specifically in North America, with urbanization on the rise, and factories opening up, giving jobs to people who were most commonly left out to dry. Women were brought into the workforce for one of the first times ever, but although so many progressive things were happening, the old mentality had still not gone away. Cue the writers of the Canadian Whites. Due to laws that had been put into place during the war, leisurely things were no longer allowed to be brought in from the United States to Canada. In those days, children did not have something like TV or iPhones to keep them entertained; their equivalent of an iPhone was a comic book. Imagine a ban being put in place today stating that iPhones were no longer allowed to be shipped into Canada. One way or another, someone would have to come up with an idea to fix this problem. This exactly what happened to the comic book industry. 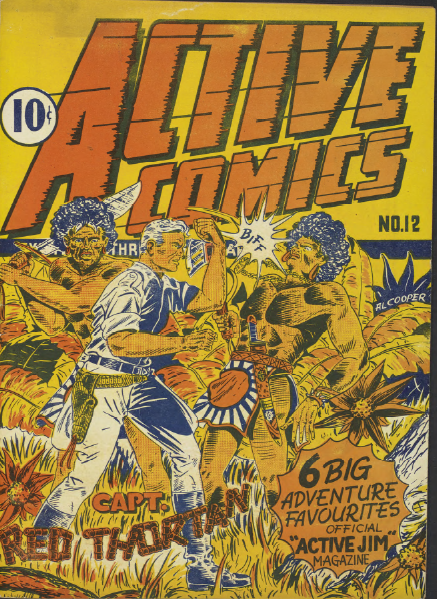 The Canadian Whites came into play during the time of a struggle during the Second World War, and they essentially were the reason comic books were so popular in this time in Canada. The comic book was something that had never truly been Canadian before, but as time had trotted on, the Canadian Whites were making a name for themselves. Although the Canadian Whites phase did not last very long in Canada, they brought something to the nation that will never be forgotten. “With the end of most original Canadian comics publishing ending in 1947, Canadian superheroes disappeared… In the early seventies however, new alternative and underground comics (or commix) publishers emerged in Canada, and some creators began to dream of a second generation of national superhero’s. The search for Captain Canada or a similar superhero had begun. ” (Guardians of the North, 1). What the Canadian Whites had done was lay the foreground for the later comic book creators to resume what had already been started for them. They laid the groundwork for some of the most important Canadian comic book material that had ever been thought of. A brief history on the Canadian Whites would cover the fact that Canadian Whites were people who saw that something needed to be done for the greater good of society. The Canadian Whites had a void to fill, for all Canadian children and adults alike. What they had to do was create their own line of comics that they could still enjoy. What is underlying in all of the comics by the branded “Canadian Whites” is the mentality embedded with all of the people of this time period. Essentially, whatever the authors were thinking in that time was exactly what they were compelled to write about. 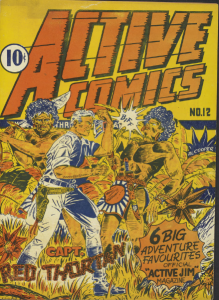 For example, the comic book in particular that will be uncovered is from Active Comics from July of 1943, which just so happens to be in the middle of the Second World War. There are many things that can be inferred about this period in time. Stereotypically, one would imagine that an old school mentality was the mentality in which everyone had at this time. In times past, the way people thought was a lot more narrow minded than the way of the world today. People did not like when things were out of the ordinary and different. They would have much rather had everything stay consistent all the time. Imagine being a woman in this time era for instance. Everyone believed that a woman needed to look a certain way, be a homemaker, take care of the children, and have the money brought home to her by her husband. A woman who wanted to do something for herself, or stand up for herself was looked at in a way that made her seem strange. Being something different was not something that people had encouraged in the 1930s-1950s. Through the majority of the comic book storylines that were brought forth by the Canadian Whites, you get a sense of racism, sexism, and overall an overall distaste for things that are not the conservative way of thinking. “It can be assumed that Canada would have emerged from the depression of the 1930s into a moderate and continuing prosperity without the intervention of World War 2” (Phillips, 7). With the intersection of the Second World War, education and prosperity of the men was put on hold, to battle. At the same time though, it was somewhat the opposite for the women. As aforementioned, with the Second World War came opportunity for the women to place themselves into the workforce, and make something of themselves. This places them in the center of the rise of urbanization and factory work. There was a sort of preconceived notion that a lady was just supposed to say at home and take care of the children while the men were at more, but they were worth so much than that. Propaganda was created along with this preconceived notion, and a lot of this mentality shines through in the comic book story lines. The woman was the subject of sexism in a multitude of ways. What is beyond the surface is the fact the women were much more than the men had made them out to be. “All told, more than 8 million women joined the labor force, an estimated 3 million more than would have done so normally” (Wynn, 474-475). This goes to show that although people had this frayed ideal of what a woman was supposed to do, they were able to somehow rise to the occasion and show that they were more than what the men with the old mentality thought. 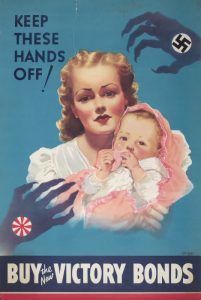 The women of this time were almost used as a tool to promote whatever the government felt was necessary to promote and sell during the war. They were used as a prop in their game to make money, and to promote hate against the Axis powers such as Germany Italy and Japan (to name a few). The women were made out to be the victims that needed to be saved by a man in every circumstance they could find. 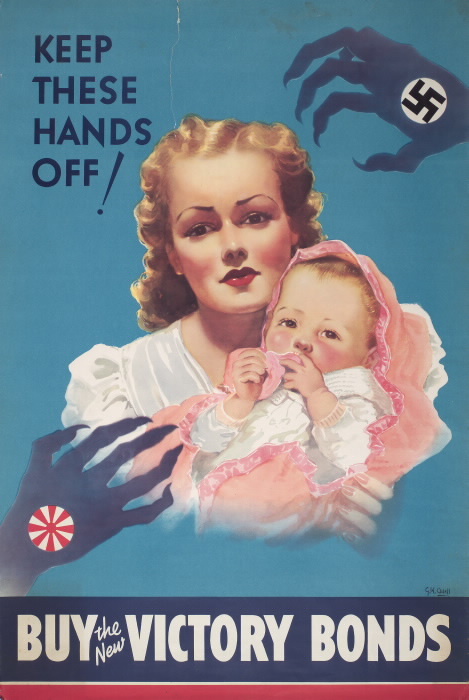 The relevance of this poster captures the essence of what propagandists in 1943 were all about. This correlates to the embedded mentality of all the men, that a woman was unable to do anything for herself, other than taking care of children, and that if she ever needed to get any kind of work done or make some money, a man would have to come to her aid or it would never get done. Specifically, in Active Comics number 12, in one of the storyline threads “Thunderfist”, there is a story about essentially a woman being careless and ignorant trying to save the people around her while she is really making it worse for herself. The comic begins with a man and a wife reading the paper and finding out that someone had stolen the superhero of the town that they resides in costume. This prompts the woman to ask her husband all kinds of questions about the superhero, and how this is a terrible thing that is happening in their community. This then leads the husband to ask his wife what the sudden interest is in the superhero, subliminally implying that the husband is somewhat jealous, and does not trust his wife so much to the point where he is questioning why she is asking questions. In the story we find out that two men have stolen the superhero’s clothes and they are out in the city doing things a true superhero would never do. After the wife asks so many questions, she feels compelled enough to go out and help the superhero Thunderfist (there is another underlying story from another comic thread that implies that Thunderfist this superhero who has his identity stolen from these men has already saved this woman from a disastrous situation at least one time in her life before). Through the story, the woman is made out to be a damsel in distress, and essentially leads to the notion that she is not able to do anything for herself, that she needs a man to save her. This is not to say that every woman in that time period actually did act in this way, but the general overview of how women are perceived is misconstrued through the works of these comics. “Whatever the changes in female employment, most met continued resistance and opposition. A fear of so called ‘New Amazons’ was widely evident and discrimination persisted. Women were generally segregated, denied top positions, and despite equal wage policies paid on average 40 cents less than men”(Wynn, 475). Although we cannot say for sure, through the works of the Canadian Whites, most specifically through Active Comics and the story line of “Thunderfist”, one can see the relation between what the men were writing about in terms of women, along with the ideal of the people of that time. Instead of fiction in the comic books pushing for women to be treated the same as men, they were pushed down further into a hole of segregation. They were only seen as beings to be sexualized, taking advantage of their beauty in a way that was insulting to women everywhere. Through everything, women were made to seem like people who were not actually worth anything, and they were made out to be these damsels in distress that had been a preconceived ideal in the mind of a man in the 1930s and 40s. In reality, the women came into the workforce with class and determination and turned all the stereotypes on their heads. The women proved that they were able to work for themselves and become something, despite what the men thought. They broke past what had been written about them in comic books and proved to the world that a woman can save herself. Phillips, Charles E. “Education in Canada, 1939-46.” History of Education Journal, vol. 3, no. 1, 1951, pp. 7–13., www.jstor.org/stable/3659220. Wynn, Neil A. “The ‘Good War’: The Second World War and Postwar American Society.” Journal of Contemporary History, vol. 31, no. 3, 1996, pp. 463–482., www.jstor.org/stable/261016.